The Eurasian Hoopoe, commonly referred to as simply Hoopoe, is a rare visitor to Britain. These exotic-looking birds, not much bigger than a Blackbird, feed on insects, sopiders and other small invertebrates in closely-cropped grassland. The few that visit Britain usually arrive in April or May, and they tend to remain close to the coast. 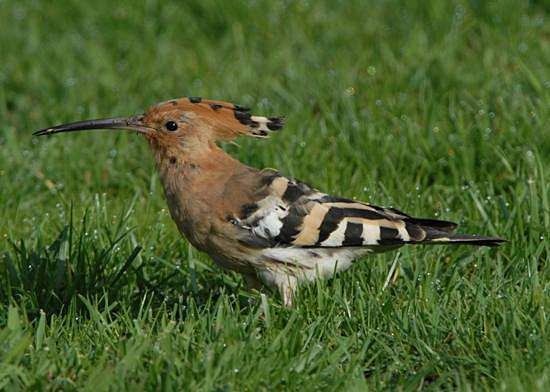 Although Hoopoes can turn up just about anywhere in the the British Isles, they are mainly seen in the south of England or in South Wales. In southern Europe the Hoopoe is a very common sight on golf courses, where the grass is regularly watered and so provides plenty of food for birds such as these. They move slowly with a bobbing gait, probing the turf for food with their long curved bills. Although very occasionally a pair of Hoopoes will breed in Britain, they are not reported to have produced surviving offspring. 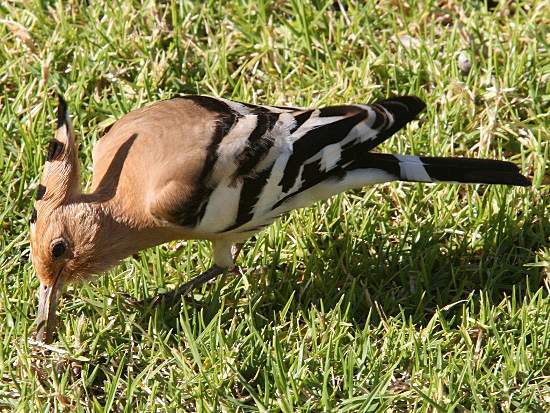 Hoopoes spend the winter months in Africa.